Sun, Sea and Shipwrecks... in Cyprus! 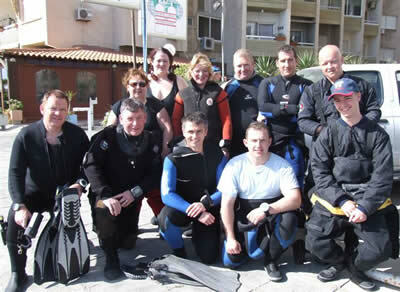 Leaving the chilly coast of Ireland, divers from Newry & Mourne Sub Aqua touched down in the warmth of Larnaca, Cyprus, ready for an exciting schedule of dives, dives and more dives… Although many members are experienced at overseas diving, for many the novelty of diving in warmer waters was a first, and an all too welcome opportunity. A mixed group of very experienced veterans to novices travelled on what was the first annual outing, and boy, what a time was had by all! Larnaca with the Shipwreck "Zenobia" was the port of call. Considered one of the top ten shipwrecks in the world to dive, The Zenobia is a 178 meter, 10,000 ton roll-on roll-off ferry which was on its maiden voyage when it developed ballast problems. Preventing traffic from entering Larnaca Harbour and listing heavily, it was towed about half a mile where it sank two days later, taking the 104 articulated lorries that it had aboard, with it. The top of the wreck sits at 16 meters, descending to the seabed at 43 meters. Visibility on a bad day is around 20 meters, on a good one you can clearly see the entire shipwreck from the airplane flying in! The diving was absolutely breathtaking, perfect for allowing everyone to dive to their capabilities. Some preferred the spectacular wildlife, others penetrating the depths of the ship, going where few men had gone before. Others enjoyed the sheer scale of the ship, the massive propellers and lifeboats to the small unbroken eggs still intact 28 years later. It’s said the smell will never leave you if your buoyancy is bad and you break one! Trust in your buddy is vital in diving, and members of the club who had not dived together before gelled together so well on this trip. In fact, so much team spirit was shown that some members were held by their feet over the side of the boat to stick their heads under the water to watch the growth in confidence of newcomers. The continuing development of the trainees brought much satisfaction to all whilst the youngest family member had a chance to try it all out, with great results. The food was great, the Craic' was mighty and the company fantastic. Many thanks goes to those behind the scenes who arranged it all. If you would like to be a part of a community of divers, why not come along to Newry Pool on a Wednesday night and have a "Try-Dive" to get a taster of a wonderful and exciting pastime. To open up your world to new possibilities…. To make your holidays more memorable, Contact Peter on 07836774694 or visit the website www.newryandmournesubaqua.com.